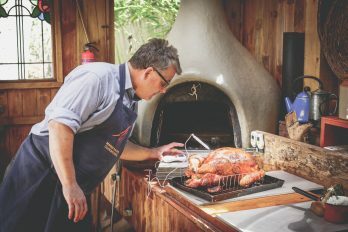 Woodfired Christmas Turkey is the best way to cook your bird for many reasons – the fantastic flavour, the super succulence and the space saving from your conventional kitchen being up there at the top. make sure your turkey will get through your oven door! 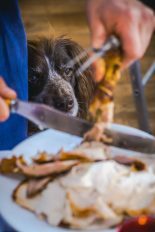 Ready for carving – to an audience! Make a brine for the turkey in advance from a solution of 12 pints water, some bay leaves, 1tbsp juniper berries, a couple of cinnamon sticks, some star anise, 200g salt, 200g treacle, 2tbsp black peppercorns, 1 chopped orange, 1 chopped lemon, 2tbsp coriander seeds, a small bunch of fresh thyme sprigs and 2 red onions cut into chunks. Put the turkey in a large container and add the cooled brine. We use a big saucepan. If the turkey bobs up, weight it down so it’s under the surface of the liquid and leave in the fridge or somewhere equally cool for 24 hours. Take the turkey out of the brine and pat it dry all over with kitchen paper or j-cloths. 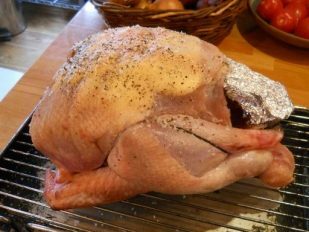 This may seem unnecessary but since we’ve been brining our turkey, they do stay incredibly moist so definitely worth it…. and the smoke flavours adhere better to the bird when it’s been brined. We are using our Bushman oven as it has a good thermal mass which won’t cool down too quickly. 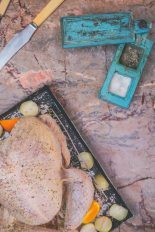 If your oven hasn’t got so much thermal mass, keep the temperature by keeping a small fire burning with kindling so the turkey cooks through. 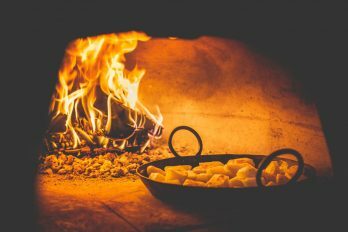 Unlike with the Bushman style ovens though, you won’t be able to go off and do something else; you’ll have to stay with your oven while your family are opening presents or drinking a sherry or 2! Soak some wood chunks for 30 minutes or so in cold water. We used hickory but you could use cherry, apple, oak, maple….if the chunks are big, chop them down a bit with your axe. Stuff the turkey underneath the skin with plenty of softened butter and add a lattice of streaky bacon over the breast to protect it if you want to. 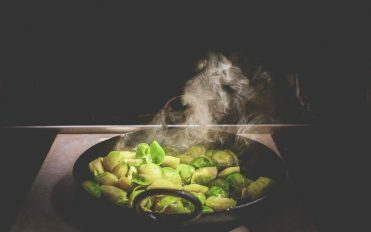 Put the bird on a wire rack in a roasting tin and add some veggies underneath the turkey – onions, carrots – with some herb sprigs; thyme is out favourite. Slide the roasting tin into the oven. Add the soaked wood chunks on to the embers with a peel. Put the door slightly ajar so the smoke can escape and leave the turkey in the oven for an hour. After about an hour or so, turn the turkey round and take the bacon lattice off so it starts to colour on the breast skin. After an hour and three quarters, take the temperature of the bird with a probe thermometer. 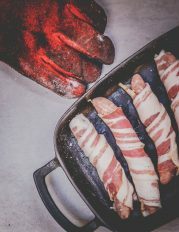 Check the deepest part of the meat around the thigh but we probe it all over to get a general idea of how it’s cooking. You’re aiming for 70C. Our 4kg bird took 2 hours to get to 74C and the conventional cooking guide was 2 hours 45 minutes so do be careful not to overcook your turkey. 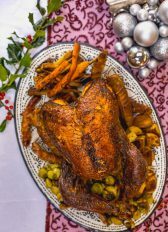 When the turkey is cooked, take the roasting tin out of the oven, cover the turkey again with foil and let it rest for a good 45 minutes while you finish the rest of your prep and make the gravy, using the juices from the bird. 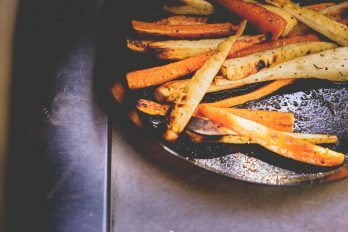 If you’re planning on cooking your veggies in the woodfired oven, you’ll have to do a reheat with another small fire otherwise it won’t be hot enough to roast your potatoes. Make sure you probe your turkey to get the temperature.